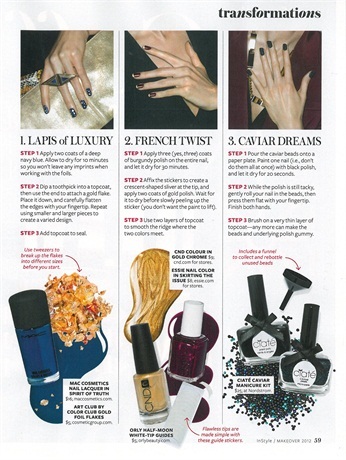 InStyle's September 2012 issue featured three easy manicure ideas — each with three easy steps — for the fall season. Inspired by the marriage of blue and gold in a lapis lazuli gemstone. Use blue polish and Color Club gold foil flakes. Step 1: Apply two coats of a deep navy blue. Allow to dry for 10 minutes so you won't leave any imprints when working with foils. Step 2: Dip a toothpick into a topcoat and then use the end to attach a gold flake. Place it down, and carefully flatten the edges with your fingertip. Repeat using smaller and larger pieces to create a varied design. Step 3: Add topcoat to seal. A Modern version of the French manicure with a saturated base and a metallic tip. Use CND's Gold Chrome, Essie's Skirting the Issue and Orly's Half-Moon White-Tip Guides. Step 1: Apply three coats of burgundy polish on the entire nail, and let dry for 30 minutes. Step 2: Affix the stickers to create a crescent-shaped sliver at the tip, and apply two coats of gold polish. Wait for it to dry before slowly peeling up the sticker. Step 3: Use two layers of topcoat to smooth the ridge where the two colors meet. Channeling elegance and glam rock, these nails are on the rise. Use Ciate's Caviar Manicure Kit. Step 1: Pour the caviar beads onto a paper plate. Paint one nail with black polish, let it dry for 20 seconds. Step 2: While the polish is still tacky, gently roll your nail in the beads, then press them flat with your fingertip. Finish both hands. Step 3: Brush on a very thin layer of topcoat. Any more can make the beats and underlying polish gummy.